I’ve been trying to decide what to do with the big pack of lamb shoulder chops that we got from the farm last month. I hate to waste any food on a bad recipe, but since lamb is not always in our shares, i especially wanted to turn this meat into something special and tasty. Inspiration hit when we were visiting family. On the way out my brother-in-law gave us a 1/2 growler of beer that was sampled that evening to take home along with the 2 other growlers of homebrew. “If you dont think you’ll drink it, you can always make beef carbonade with it”, he said. He quickly ran to my parents computer and printed out a recipe that he and my brother describe as “awesome”. Because we had no stew beef, we almost passed on making this recipe with the home brew until I thought about the lamb we had in the freezer. 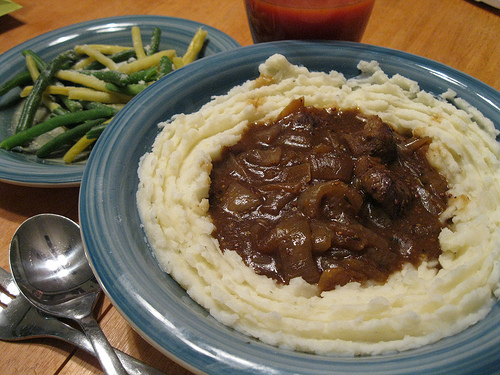 It was the perfect subsitute for the fatty stew or chuck beef that was originally suggested. The lamb shoulders were well marbled pieces of meat, perfect for the recipe. So I cut out the bone and cubed up the meat and followed the rest of the recipe, from the website Simply Recipes. The result? Probably the best stew we made to date. I think it even topped the slow cooker Julia Child Style Beef Burgundy, which has been our go to recipe when we received stew beef in our winter shares.